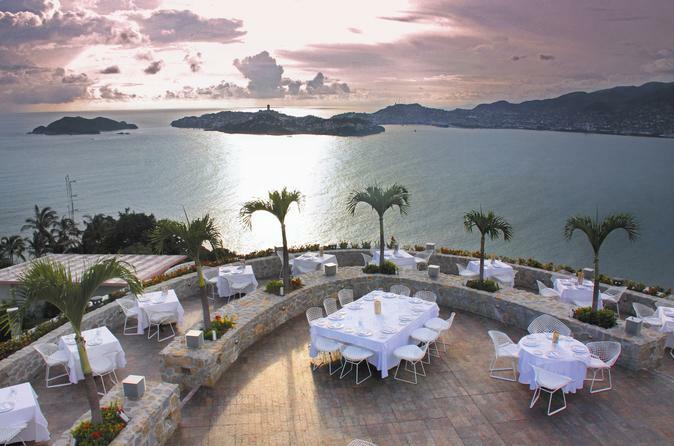 Enjoy a romantic open air three courses dinner at one of the best restaurants of Acapulco "The Bella Vista" of Las Brisas Hotel followed by a drive across the main avenue of Acapulco all the way to the west coast and out of the bay to admire the and internationally famous divers of La Quebrada. Your driver will punctually pick you up at the lobby of your hotel and take you to one of the best restaurants in Acapulco where you will enjoy a great three course dinner and glass of domestic wine or a cocktail with a fantastic view of the bay of Acapulco. Afterwards your tour guide will drive and tell you everything there is to know about the city of Acapulco and will explain everything regarding your next stop which will be at the most important Acapulcan exhibition, the High Cliff Divers of La Quebrada. Once there, you will be able to enjoy up to two complementary domestic drinks. After the diving exhibition, you will be dropped off at your hotel.